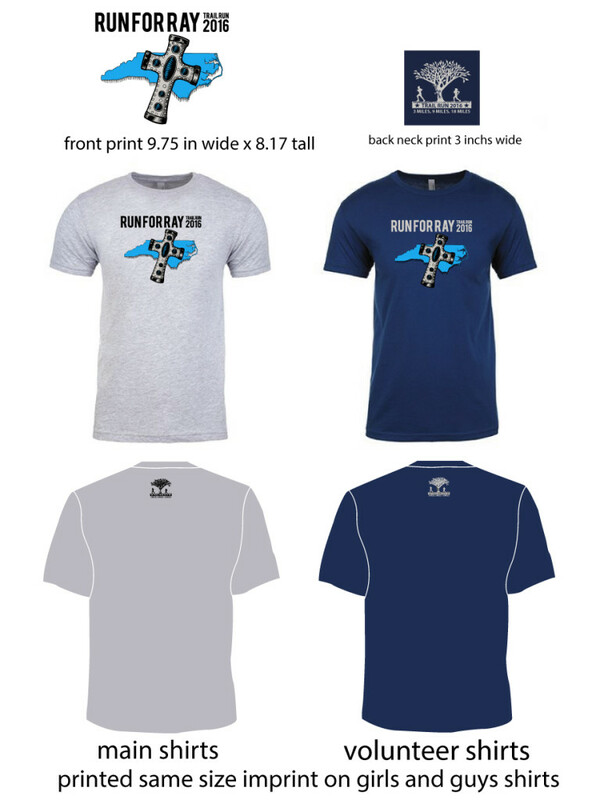 Run for Ray – February 20, 2016 | NC Race Timing and Running Events | Go Time! Participants may choose to run or walk this TIMED 3, 9, and 18 Mile trail course. See course descriptions below. Please plan to be at the start line 10 minutes prior to the start of the race wearing your race number on the front of your shirt. The Run for Ray is coastal North Carolina’s premiere trail running event. 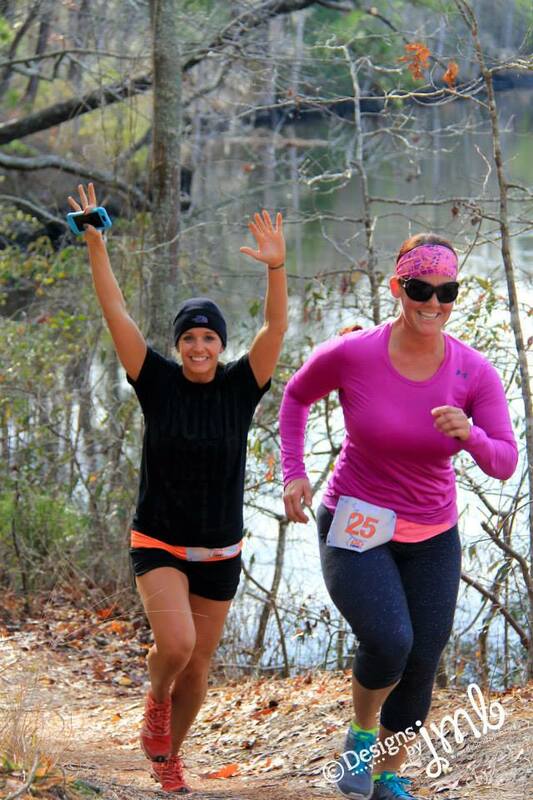 Located on the packed pine straw trails on the low bluffs near Town Creek, The Brunswick Nature Park once again will play host to the event. The stacked looped single track trail system offers runners a challenging adventure, with many vistas just above the creek and just below a canopy of pine. 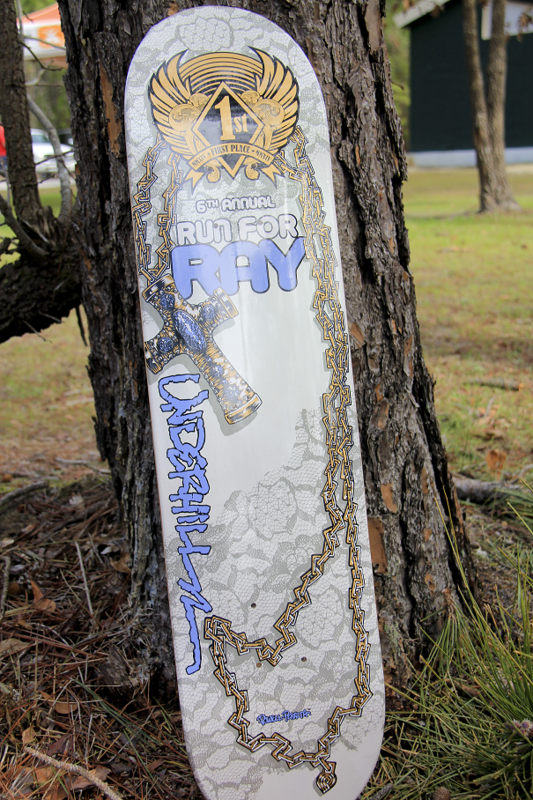 Top finishers are given the most unique prizes in trail running – custom Powell-Peralta skate decks, just like Ray would have liked it. The Run for Ray Trail Run is a fundraiser for the Ray Underhill Foundation. The Foundation raises money to help families that are affected by Chordoma and other cancers, to help them cover expenses that are not paid for by health insurance or government funding. 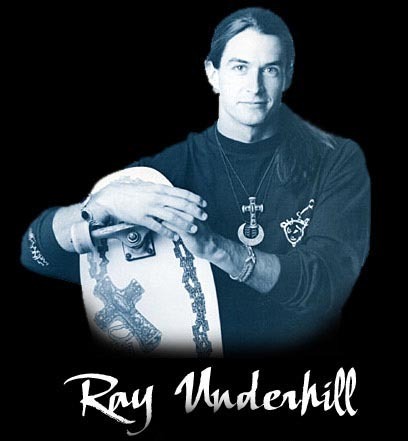 The organization was established in memory of Ray Underhill, a father, husband, friend, and professional skateboarder who passed away in 2008 after a long battle with Chordoma. Ray Underhill spent the last two years of his life battling a chordoma brain tumor. Despite the conditions debilitating effects, Ray maintained the kindness and strength he was known for. He was an example to his family and to his friends of what it means to be a father, a husband, and a friend. Throughout his ordeal, Ray never let his spirit succumb to the cruelty of the condition. Ray will be remembered by some as a Powell-Peralta Bones Brigade pro skateboarder of the late 80’s with the smooth style and deep bag of tricks. By others in the skateboard industry, as the Gullwing team manager or web master at Eastern Skateboard Supply. To those who knew Ray, he is remembered as the guy we wish everyone else would emulate. Ray’s kindness, candor and his sense of humor should be an example to follow. If everyone in the world were just a little more like Ray, what an amazing peaceful place this would be. Ray was born October 18, 1962, in Nashville, TN. He relocated to California in the mid 80’s to become a pro skateboarder. He married Kerry on September 5, 1992 and became a father when Keaton was born in 1995. They moved to Wilmington, NC in 1998 and worked for Eastern Skateboard Supply. His daughter, Olivia, was born in 2000. He was a volunteer at Ogden Elementary School. He was known worldwide and loved by all. He was a loving husband, father, son, brother and friend. After surgery, and several radiation and chemotherapy treatments, Ray passed away on Friday morning, August 1st, 2008 at a hospital near his home. The terrain is technical, hilly, and the trail can be very challenging in some areas. Aid stations will be at various locations along the course with water and cups available. In an effort to Go Green with this event we ask you bring refillable water bottles or a Camelbak for which we will have plenty of water in coolers. Top quality, ascetically pleasing, male and female cut shirts will make you look better than your friends – it’s a fact. Participants who register by February 1, 2016 will be guaranteed one of those shirts. Pre-registered participants may pick up their race numbers and shirts at packet pick up listed above. For those who wish to register in person, you may do so at any Packet Pickup listed above. Online registration closes at 11:59 p.m. on February 17, 2016. There is a $3 online credit card processing fee.